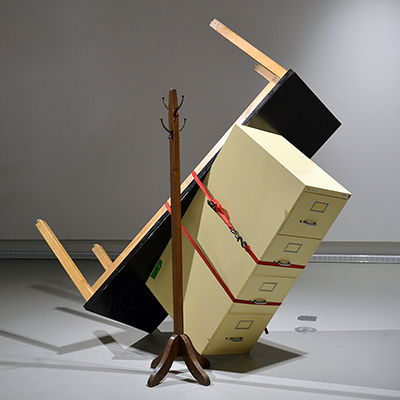 In the Mauricie region, from March 15 to 31, the artist was invited by the Galerie d’art R3 at the Université du Québec à Trois-Rivières, to present Point de basculement. This exhibit takes the form of a large-scale installation created mostly from furniture borrowed from the university’s storehouses. During a short creation residency, the whole space has become the ground for a series of short-lived interventions spurring a new poetic reading of the surroundings. The goal was to spark off a reflection on the occupation of the space, the notion of daily life and human precarity.